Over the past two weeks, when I looked back at the two-part Amazing Spider-Man #374-375, I bemoaned the David Michelinie/Mark Bagley collaboration as the “last great Venom story of the 90s.” Notice how I made sure to set an arbitrary cutoff at the 1990s, because despite how poorly (and frequently) Venom has been used by Marvel for the past 20 years, I do believe there are a few highlights worth mentioning. Such as the Paul Jenkins/Humberto Ramos Spectacular Spider-Man (vol. 2) five-parter, “The Hunger,” which was released in 2003 (and not in the 1990s, ‘natch). I was reminded of the story’s existence during my write-up of a recent issue of Superior Spider-Man when I asked whether or not Ramos, throughout his distinguished career, had ever had a chance to illustrate Venom over the span of a multi-issue arc. The second volume of Spectacular is a somewhat tricky one for me to remember. I’m fairly certain I read parts of the series when I started collecting ASM again after my lengthy post-Clone Saga hiatus, but I definitely missed “The Hunger.” Fortunately, via the power of the Marvel Unlimited app on my iPad, I was able to quickly access these issues, which I was fairly excited about since I’m a fan of both Jenkins and Ramos as creators and collaborators. 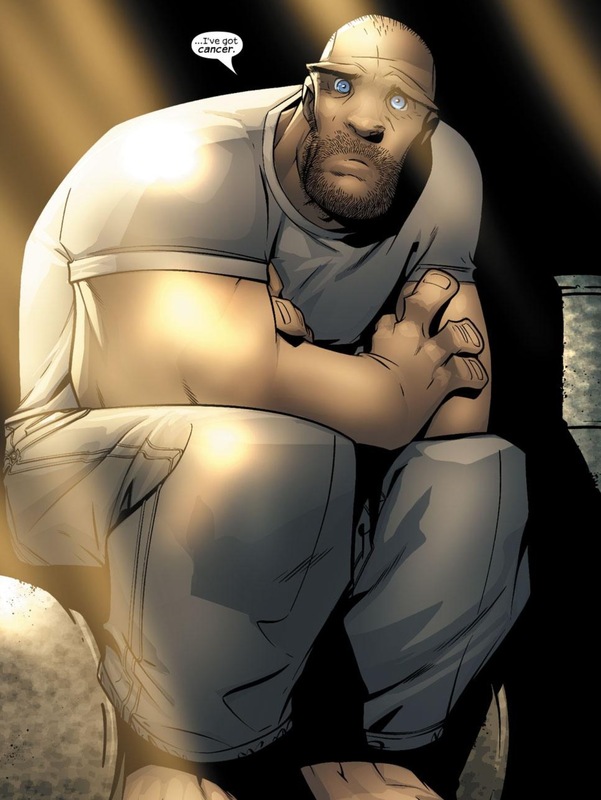 It’s no shock that Jenkins was able to craft a well-written and compelling story about Venom and his alter ego, Eddie Brock, because Jenkins had such a knack of unearthing interesting character moments for all of his subjects during his run on Spectacular and Peter Parker: Spider-Man. I think the only other Spidey writer besides Jenkins who has ever been able to focus so heavily on characterization rather than comic book “action,” and do so in a way that can hold my interest over multiple issues, was J.M. DeMatteis. Throughout “The Hunger,” Jenkins even has his Spidey making cracks about how he’s “supposed to be punching someone.” But in-between the moments of meta-commentary, Jenkins introduces a new and critically important piece of information about Eddie/Venom and why he is the way he is, thereby making the character interesting for the first time in a decade. Jenkins builds his drama slowly in this story, first presenting it as a murder mystery of sorts, as the symbiote is seen targeting and murdering cancer patients by sucking their adrenal glands dry. 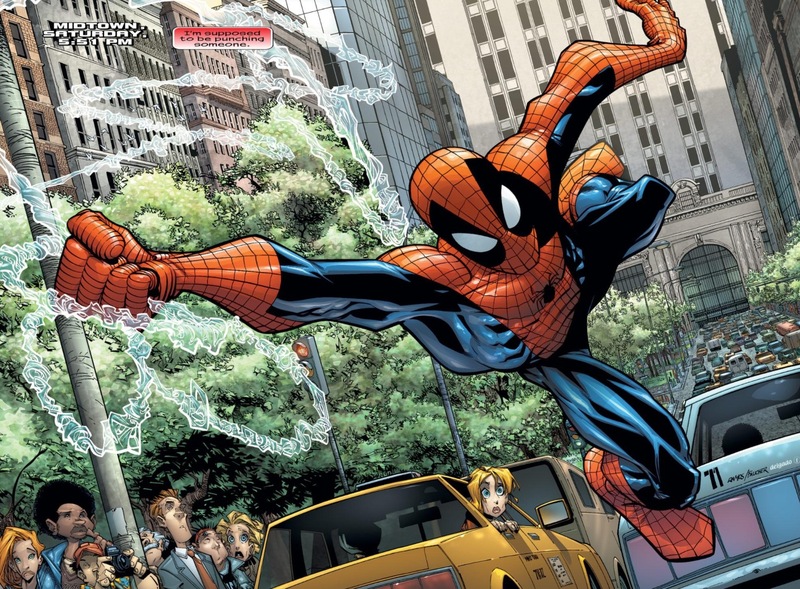 The murders naturally arouse the attention of the New York Police Department and Spider-Man. But rather than just have the story devolve into another Spider-Man/Venom punch-kick-fest that doesn’t advance either character, Jenkins keeps turning the screws, asking (and mostly answering) the all important question “why” about each character and their behavior. The first clue that something is different about this story is how Eddie is introduced to us looking sickly and despondent. 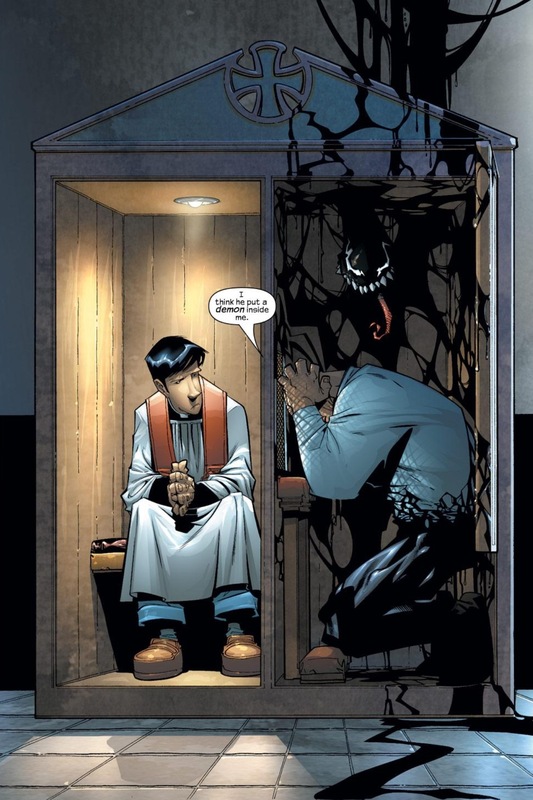 He’s in a confessional booth with a priest, telling him about the “demon” inside him. Eddie has always been portrayed a character with a twisted sense of morality that makes him come across as “holer than thou.” But certainly not as a deeply religious person, who apparently wants to atone for his past sins with the highest power he can get the ear of. Of course this scene begs many questions. Why is Eddie so sickly? Why does he appear to be distancing himself from the symbiote? What’s going on in his life that’s causing this out-of-character behavior? Once Spider-Man is able to put two-and-two together and confronts Venom about the murders, Jenkins reveals another surprise. The symbiote, long-portrayed as an amorphous blob that has feelings of “hatred” but not much else, is actually acting independently of Eddie, committing these murders in an attempt (Spidey suspects) to bond with a new host. The original editorial premise of the symbiote – that it’s an alien from another planet that needs a living “host” to survive – was certainly a wild departure from the otherwise “street-level” universe of Spider-Man. And yet, very few creators have ever treated the symbiote like an intelligent, extra-terrestrial being. In “The Hunger,” Jenkins gives the symbiote a voice, so much so, that the alien needs to be regarded as an entirely separate character from Eddie Brock by the story’s end. The net result of this creative decision is that Eddie has finally become a truly sympathetic character. After years of trying to make him an in-between good-but-not-really anti-hero, Jenkins presents the idea that Eddie is just an unwilling host for an alien who is preying on him. That idea, of course, begs MORE questions – how and why has Eddie maintained a symbiotic relationship with an alien for so long? And that’s when Jenkins and Ramos drop the bomb on us: Eddie has cancer. 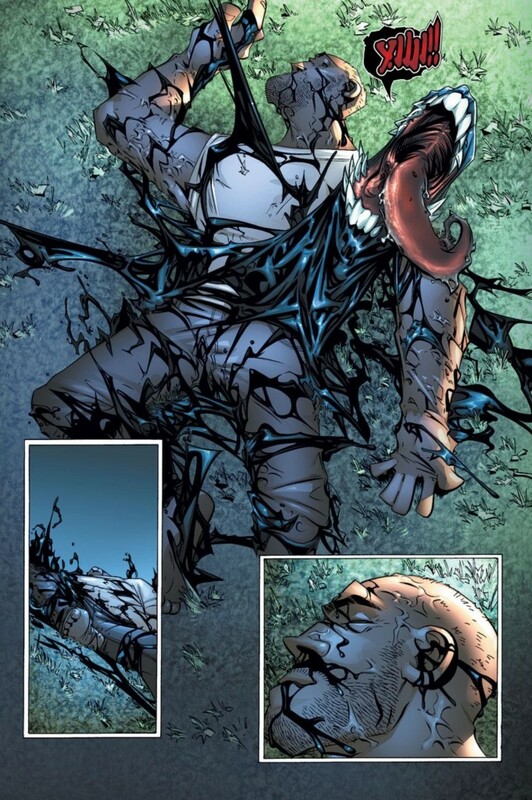 In fact, Eddie has had cancer dating back to before he discovers symbiote and becomes Venom. Now that Eddie is getting closer to death, the symbiote is trying to find a new host, and is especially interested in reuniting with his original partner in Spider-Man. But Jenkins does use Eddie’s cancer to fill in some blanks as to why he’s been such a sociopath as it pertains to Spider-Man. For years, the character’s lust for Spider-Man’s brains and caracass was explained as Eddie and the symbiote having a shared hatred for Spidey (Spidey ruined Brock’s career, and he rejected the symbiote). 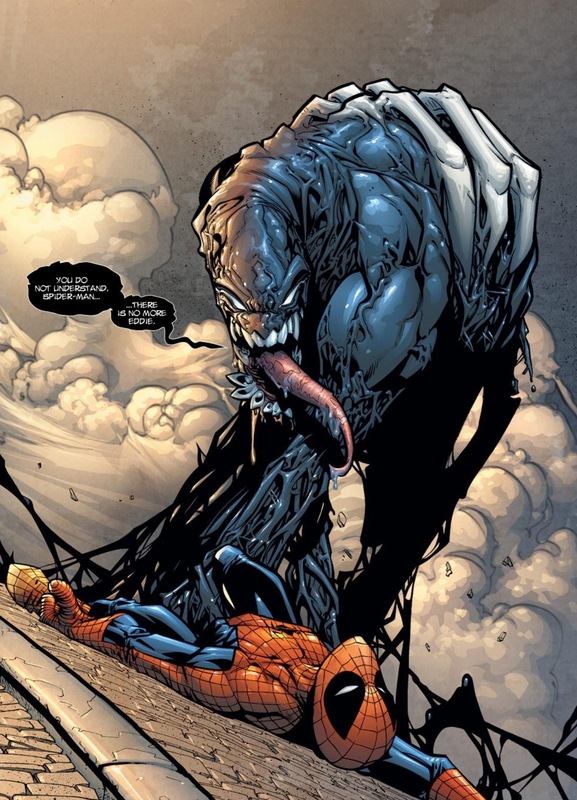 However, Jenkins suggests that the symbiote has made its intentions with Eddie early on – it has always sought a reunion with Spider-Man – and Brock has always acted like a pyshco because he was afraid of what might happen to his cancer-ridden body if Spider-Man were to ever accept the alien. This plot twist from Jenkins doesn’t justify the evil acts Eddie committed, but it does provide a ton of clarity about his motivations. If keeping control of the symbiote was a life or death situation for Eddie, then it makes total sense that he would go to great lengths to eliminate Spider-Man and anyone else who got in his way, or who tried to separate him from the alien. 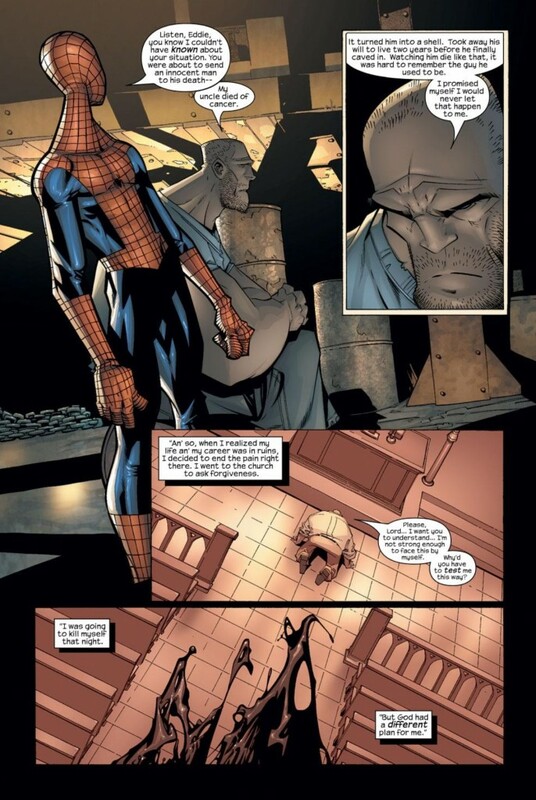 Thanks to Jenkins’s script, some of Eddie’s past actions, like kidnapping Spider-Man and bringing him to a deserted island, suddenly are put into better context. “The Hunger’s” final chapter is a wonderfully constructed piece of drama from Jenkins and Ramos. In this issue, Eddie has been without the symbiote long enough that he’s now only got hours to live, while the alien continues to seek Spider-Man as its host. 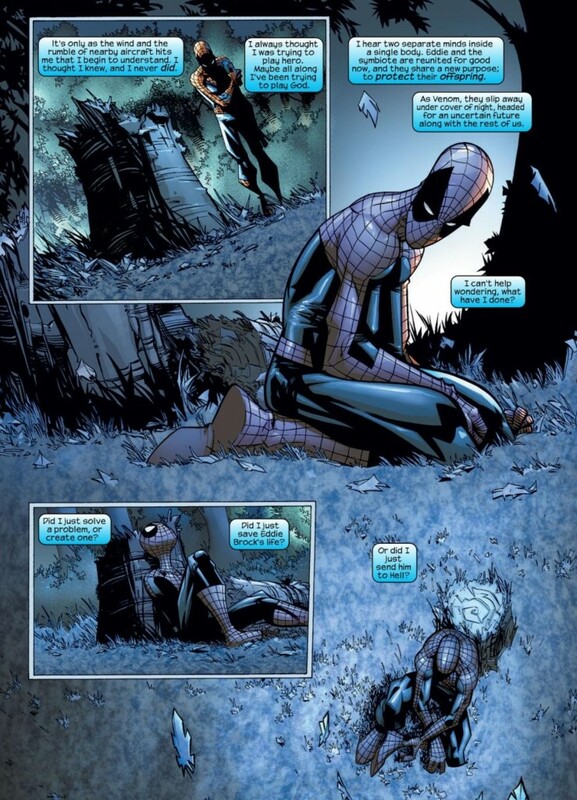 As Eddie “dies,” Spider-Man starts a countdown for the alien – either he accepts Eddie as his host, or they both end up dying due to being disconnected from each other for too long. Jenkins’s premise is so effective, every page turn feels like we’re moving closer to a clock hitting “0:00,” thereby triggering a deadly bomb. And one of the main reasons why this sequence is so tense is because Jenkins has given us a reason to care about Eddie, while also establishing the symbiote as something more than just a pile of black goo. 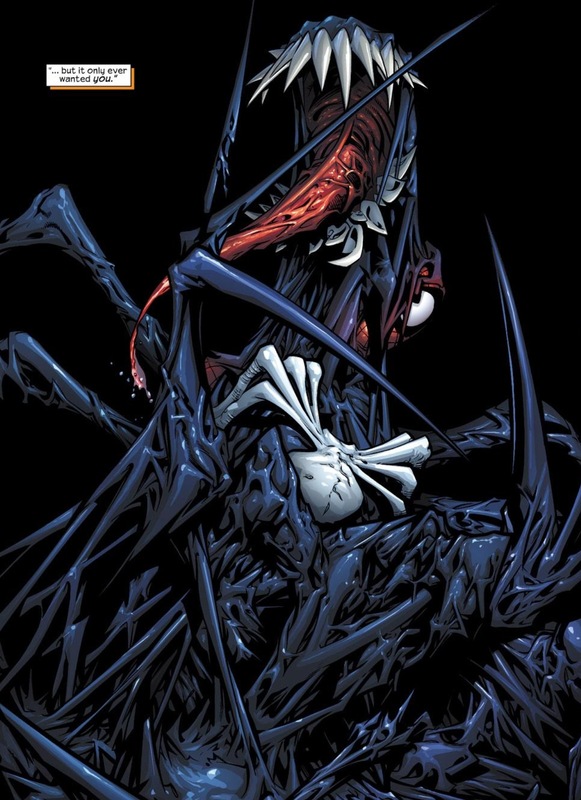 Because this is a Spider-Man comic, Jenkins can’t help but give Spidey/Peter a complicated problem to deal with by the end of “The Hunger.” After he successfully manages to reconnect Eddie and the symbiote, Spidey questions if, in an attempt to save Brock’s life, he damned him to the hell of the alien’s control. It’s such a classic Spider-Man conundrum – even when he wins he loses. I love that Jenkins has the convictions to take Spider-Man (back) to that dark place in this story. Since it was my question about Ramos’s history illustrating Venom that inspired me to seek out these issues out for a Chasing Amazing write-up, it would be a major oversight for me not to give my opinion on “The Hunger’s” art. Ramos became a “made man” for me artwise after “Spider Island” in 2011 because I thought his dynamic art style meshed well with Dan Slott’s penchant for epic storytelling. Still, I recognize that Ramos is an acquired taste and that some people are not fans. As such, “The Hunger” makes me appreciate Ramos even more, not because I think the storyline’s artwork is the best, but because it clearly demonstrates how Ramos has improved upon his earlier Spider-Man work over the past 10+ years. I actually don’t see a ton in differences in how Ramos pencils the symbiote – and I remain a fan of it as was the case when I was writing about Superior last month. But his overall ability to construct a lively an active landscape of people, buildings, etc. has improved by leaps and bounds. I think the desire and ability to improve your craft is one of the greatest traits an artist can have. You can always get better at something. Sadly, there are so many artists from the comic book industry who made money and decided that the need to improve was moot. This story certainly isn’t the BEST of Jenkin’s collaborations with Ramos (That would be the Green Goblin arc, IMO, although I do give credit for their Doc Ock arc for cementing the Doc’s personality for me before Slott came along), but it did inform all of the development that the alien and Eddie have had since then, even if a lot of those further stories don’t reference The Hunger directly. This story also took the “scorned lover” approach to the alien that have been hanging around as subtext since Amazing 317, and just made it plain text, with the alien being a downright abusive and sociopathic lover. This interpretation also help square away all the various continuity glitches and other odd bits of lore the alien has acquired, (Planet of the Symbiotes origin, I’m looking at you), including those included in this very story: the alien is a liar. It tells Spidey that it will “permanently” bond with Eddie if they do so again, just to emotionally blackmail Pete into accepting it. A note on the art: I like how downright FILTHY every scene with Eddie and/or the alien look, in all senses of the word. The page you displayed with the two of them arguing in the bathroom? Disgustingly perfect. Or perfectly disgusting. Whichever. I dug this story at the time, probably reread it once or twice, but haven’t returned to it for several years. I remember digging Ramos’s Venom and being annoyed by the litany of complaints about the anatomy, as if Ramos was trying to draw Venom as some kind of anatomically-correct medical-textbook illustration. One thing you’ll notice about Jenkins as you read more is that his MO is breaking characters (sometimes to great success, sometimes not). He does this with Flash, he does it with Norman Osborn, with Eddie Brock, Curt Connors, and others. Recently, he did an interview on the WordBalloon podcast, where he talked about the things he wanted to do with the DC heroes before he left that company. Among other things, he mentions wanting to “blow Ma and Pa Kent’s brains out,” as well as breaking the (DC) Flash’s legs. Those stories can be cool and shocking for a little while, but as Jenkins himself seems to have realized, they don’t really work long-term for big franchise characters with decades of history. You need to be using your own characters for that kind of thing. Yeah, Jenkins definitely has “things” that he likes and needs to do each time out. Still a very underrated Spidey writer. I did just see the Superior #31 news. At this point, I’m going to withold all speculation about everything because I seriously just don’t know. 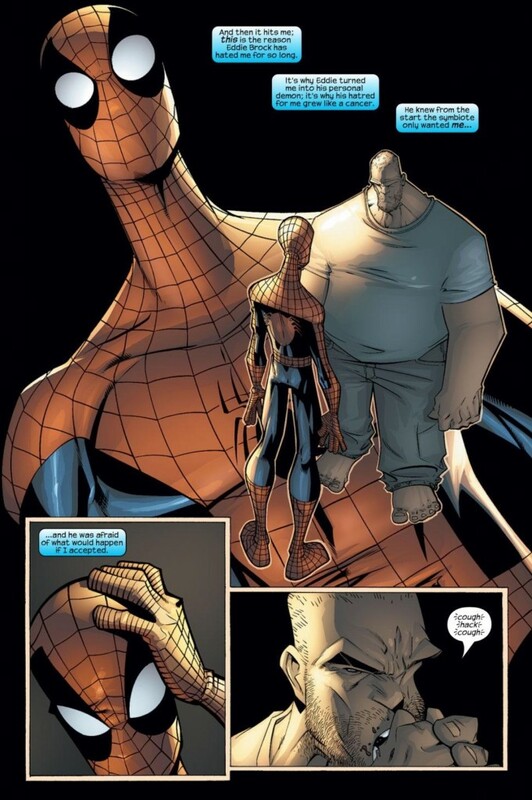 With the news of this Spidey Infinite comic with an amnesia angle, maybe your ideas about the Goblin and Peter not remembering have some validity. Or maybe something else totally different is going on. I give up and I’m just going to read these next six issues and of course ASM #1 as a fan and try to enjoy the ride. There is also the subplot that the symbiote is pregnant that has never been mentioned again. Toxin was spawned off from Carnage in Venom’s next appearance, and the Venom symbiote is desperate to get a hold of the newborn. I doubt that’s what Jenkins had in mind, but we can probably retcon Toxin as being what the alien was referring to.